← Mothering Sunday or Mother’s Day, either way it’s a day to celebrate the greatness of a mother. When a trip to Salisbury Cathedral was planned, I hoped and imagined it would be quite interesting, however what I experienced went way beyond interest, I was catapulted into a world where the grandeur and magnificence of a place was virtually immeasurable and not unlike the size of the Cathedral itself, just a bit too much to take in. The first Salisbury Cathedral was built by the Normans between 1075-92 but this wasn’t big enough for their needs and the remains can be seen at Old Sarum. 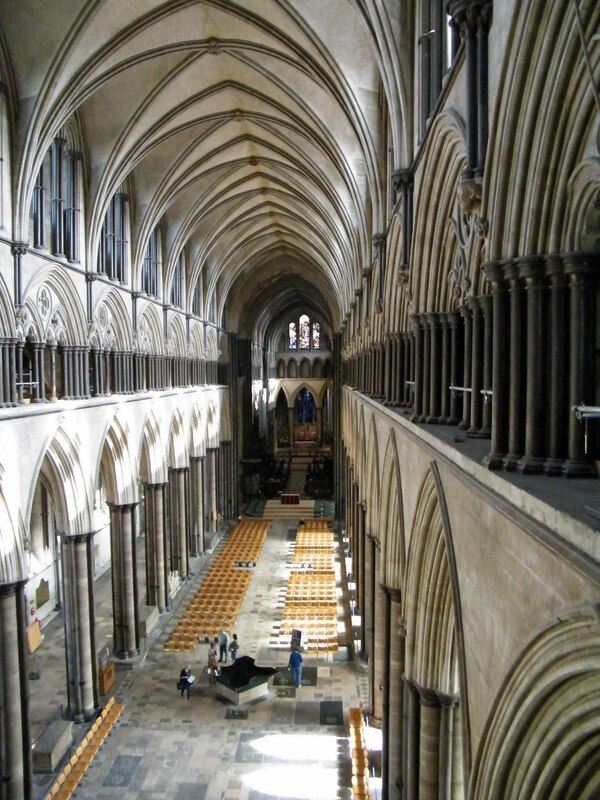 The present day construction began in 1220 and took 38 years to build. It was a further 70 years before they decided to add the tower and spire which is where our journey was going to start. The foundations of this enormous building are alarmingly a mere 1 metre deep and sit on a gravel base. Evidently there is no problem with these somewhat shallow footings as the building has not moved but imagine trying to persuade planners nowadays to pass building regs on that! 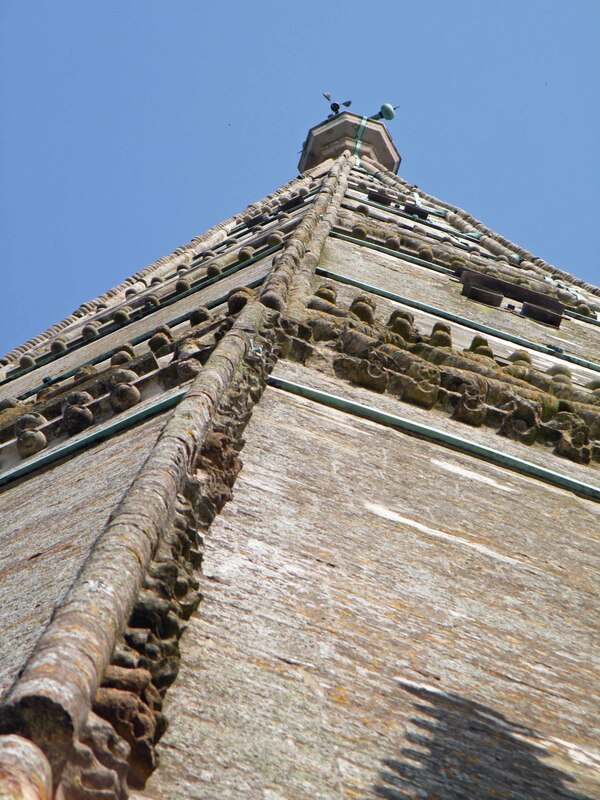 We had booked an official tour of the Steeple and with plenty of sulking and moaning from our eldest son who was convinced it would be boring, we set off, climbing the first tranche of the 332 Medieval steps. Our first port of call on the first landing was to gaze in awe at the breathtaking nave whose might and majesty made you feel compelled to stand staring in speechless amazement. You can see a slight dip in the ledge on the wall directly below the steeple, that is because the weight of the steeple was such that the walls began to sink! 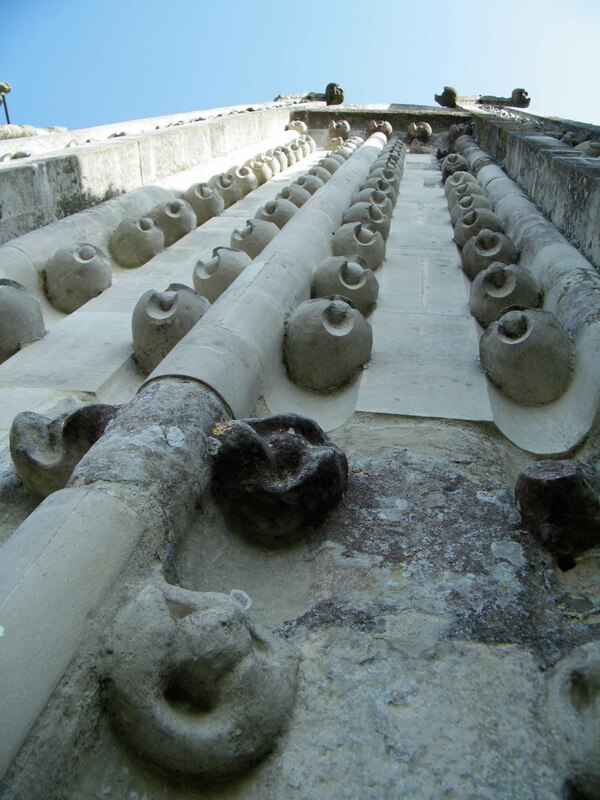 But having towered above the Cathedral for nearly 700 years, it’s unlikely to collapse at this stage, so don’t worry! There is also a rather unusual font in the middle of the nave. It looks like a huge mirror but you soon realise it is water because you can see it trickling over the sides. We moved on to find ourselves in the rib cage of the original roof. 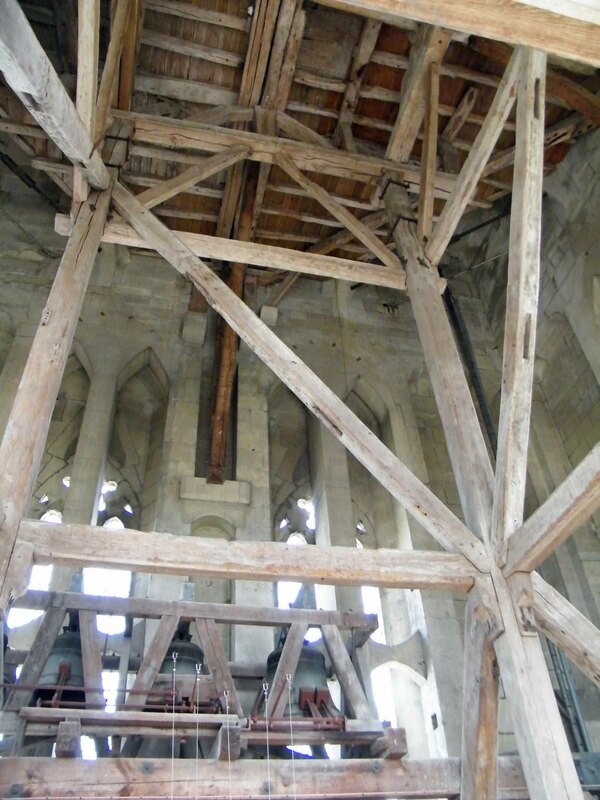 There was very little in the way of additional fixings during the Medieval era, so they had to use their carpentry skills to secure pieces of wood and hold up enormous beams and rafters. 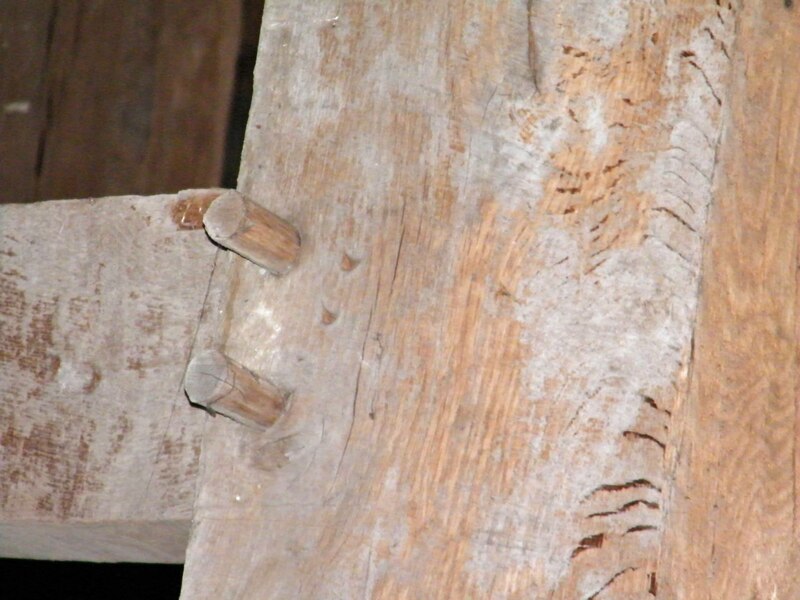 This ‘peg in a hole’ system (my terminology) has stood the test of time and not only are many of the original fixings still secure but any repairs are done in an identical fashion. As we climbed the next flight of stairs, I wondered how many hundreds of 13th century feet, both bare and shoe’d, had stepped on the exact spot I was now putting my foot. When we reached the lower part of the steeple, we were stunned to find we were standing under a wooden scaffold that had been put up several hundred years earlier to secure the steeple when it started to shift, but this ‘temporary’ structure worked so well, they left it there! Along with what is probably the oldest form of iron works in the world, the steeple is held together with a cocktail of Medieval iron bars and planks of wood! But wait to see just what this scaffold is holding up! The huge bell is another reminder of the age of this incredible building. 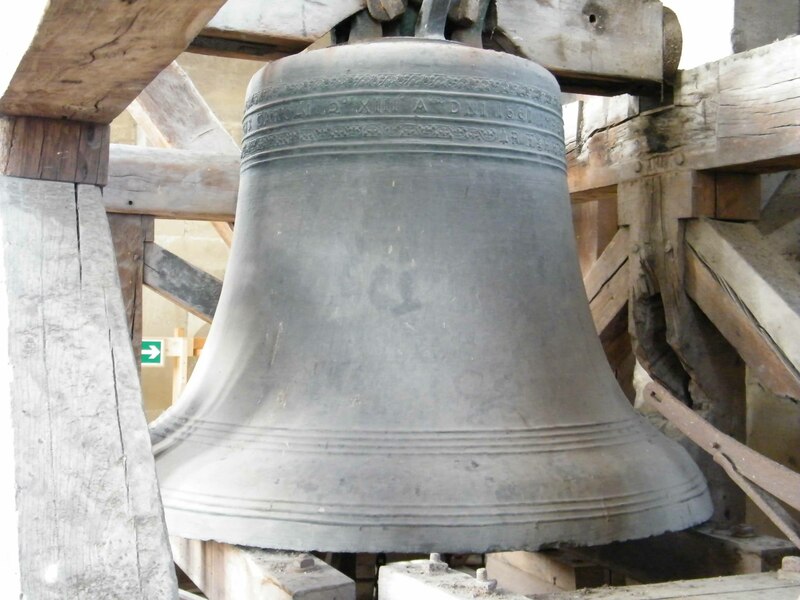 “Eleven years wasted” is engraved on the enormous bell and is reference to King Charles who was kept from the throne for 11 years during and after the English Civil War. So someone wisely thought they should do something to show their support for the King given the penalty for doing otherwise! Our next part of the journey was up a very narrow modern wooden spiral staircase that took us into the middle of the steeple. 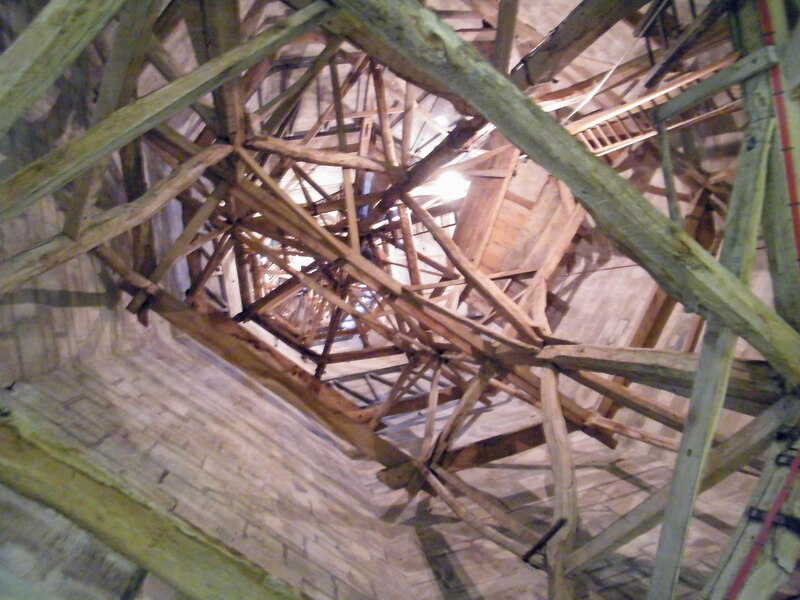 Above us was what I can only describe as a web of wooden beams that had been intricately woven to support the tall steeple. And it was here that we stepped out onto the balcony and it was from there that I felt like I was on top of the world! The views are spectacular, you can see for miles around as well as Old Sarum where the original Norman cathedral was built. It was a warm sunny day without so much as a breeze blowing; I truly felt this was something pretty special. The steeple rather worryingly leans 27″ to one side and as you stand underneath the towering architectural masterpiece, you cannot help but feel slightly on edge…quite literally! Had there been a chair up there and had I been child free and allowed to, I would have sat there for the rest of the day, but we were allowed just a few minutes to enjoy the spectacular view. I can definitely recommend a trip to the Cathedral and my advice is to go without children and put a whole day to one side, that way you can also look at an original copy of the Magna Carta along with some Medieval paintings in a nearby chapel. But whatever you do, definitely book a Steeple tour, you won’t be disappointed. 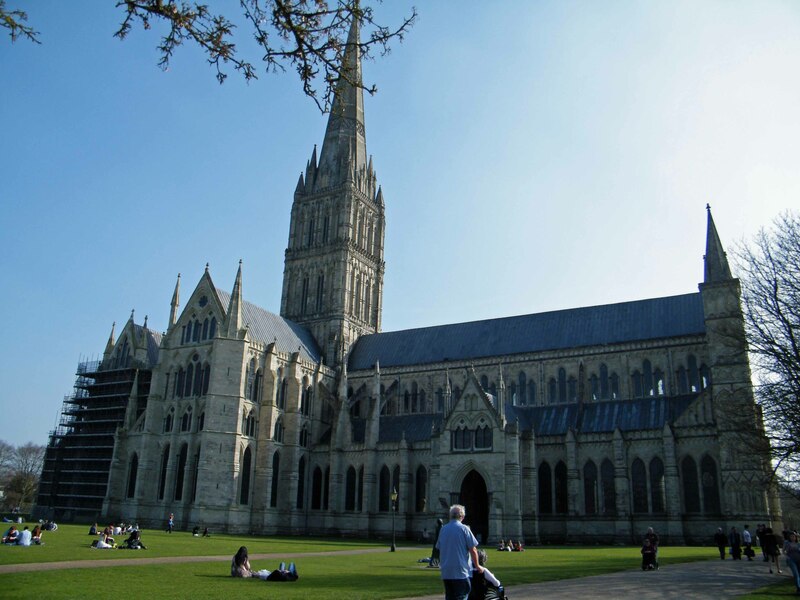 This entry was posted in Churches and places of worship, Family Days Out and tagged architecture, Cathedral, church, King Charles, Magna Carta, medieval, Old Sarum, Salisbury Cathedral, steeple, stone masons, worship. Bookmark the permalink.